Cape Town, South Africa – Weigh-ins for EFC 78 took place at the GrandWest Market Hall in Cape Town today. Headlining the card, South Africa’s EFC bantamweight champion JP Buys (6-2), takes on interim bantamweight champion and fellow South African Luthando Biko (5-1) in an attempt to unify his title. Co-headlining, South Africa’s world renowned EFC flyweight champion Nkazimulo Zulu (11-2), embarks on his sixth title defense against the UK’s Jake Hadley (3-0). Buys and Biko have been respectful colleagues within the EFC ranks for years, despite a bout between being inevitable. Both athletes have been frank in their estimation of their opponent, but avoided trash talk in favour of steel intent. Theirs is a job to be done, and it will be completed tomorrow night with only one man still calling the bantamweight title his own. Biko was as open in his regard for Buys, and his desire to win. The town of Port Elizabeth’s first EFC champion, his interim belt holds double significance, which he aims to unify. 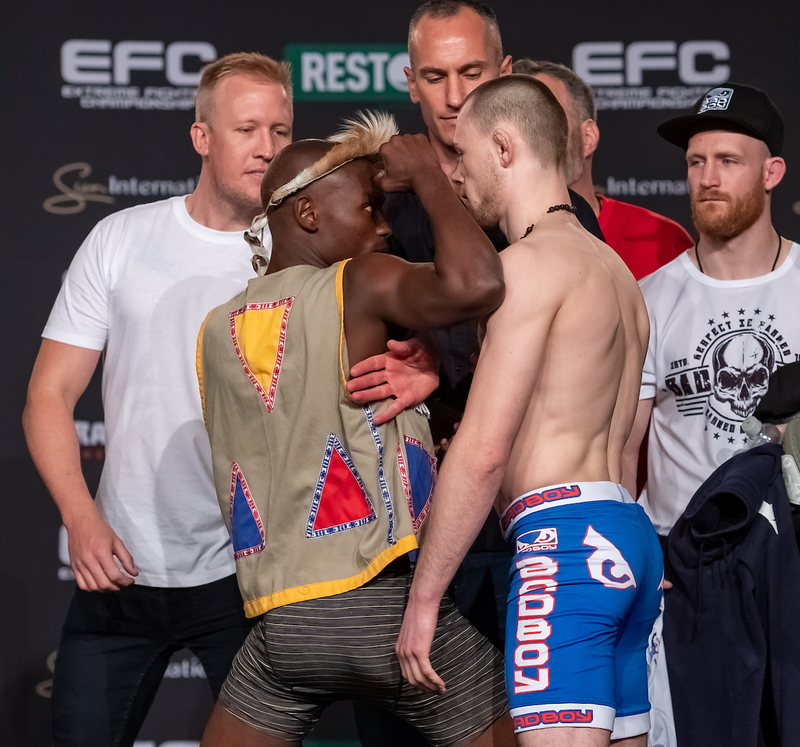 While the main event is infused with grim resolve, the co-main bout between EFC flyweight champion Nkazimulo Zulu and the UK’s undefeated Jake Hadley is boiling with bile. Zulu, notorious for sending two opponents straight to surgery, has a way of ramping the tension in any bout, such is the threat he brings. Hadley has been especially outspoken. At only 22 years old, he is supremely confident that he will unseat the man undefeated in the last five years. As earlier this week where Zulu and Hadley threatened fire on the set of the Espresso Morning Show, the two had to be kept apart when facing off. Preceding the main event, Cape Town’s own Luke Michael (4-3) returns to face the fiery Conrad Seabi (6-5) in the first fight of the scheduled EFC welterweight Grand Prix. Michael has had trouble with opponents not making weight before, and today he faced the same situation. Seabi missed weight and could not appear at the televised weigh in. Where Michael has declined to fight an overweight opponent previously, today he insisted the bout continue. Seabi will take a financial penalty allowing him to compete. The slick boxing of the DRC’s Rodrique Kena meets the highlight reel KO power of Cape Town’s new resident hero, Saxon Delafield. The last time ‘Saxbomb’ appeared in the Mother City he dealt Regis Muyambo a walk off knock out [EFC 75], and threatened the same to Kena in an intense stare down. Opening tomorrow’s main card, crowd favourite Shaun de Lange returns after a year’s absence to face fellow Capetonian Marcel Teniers in a fight brimming with excitement. Both appeared to roars from their home town fans, and beat the welterweight limit easily. Further down the card, crowd favourite Sizwe Mnikathi stepped in on the shortest notice, when August Kayambala could not appear for his bout with Port Elizabeth’s Sindile Manengela. Mnikathi is a veteran of numerous celebrated wars, and a welcome replacement for what is now a rematch with an old foe, and a stand out to look forward to tomorrow night. Christian Bobo and Conrad Seabi failed to make weight… Both athletes will suffer a financial penalty. EFC 78 Buys vs Biko, Zulu vs Hadley takes place on Saturday 13 April live from GrandWest, Cape Town. Tickets are on sold out. Full broadcast details available on efcworldwide.com.